The US Center for Science in the Public Interest (CSPI) has downgraded its safety rating of sucralose, the artificial sweetener also known by the brand name Splenda, from “caution” to “avoid” in the group’s Chemical Cuisine glossary of food additives. The non-profit food safety and nutrition watchdog group is citing a newly published study from the respected Ramazzini Institute, an independent laboratory based in Italy, which found that the chemical caused leukaemia and related blood cancers in male mice. This is the second time CSPI has downgraded its rating of the sweetener. In 2013 the group downgraded sucralose from “safe” to “caution” after the Ramazzini Institute presented the then-unpublished findings of the study at a conference. The study has now been published in the peer-reviewed International Journal of Occupational and Environmental Health. Sucralose is found in some diet sodas, including Diet Pepsi, where it is paired with another artificial sweetener, acesulfame potassium, and Diet Mountain Dew, where it is combined with acesulfame potassium and aspartame. It also appears in everything from prepared dinners and salad dressings to yogurts and cereals. 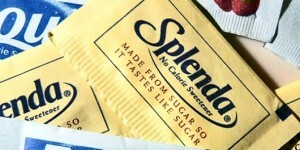 In fact, sucralose is used in more products in the United States than any other artificial sweetener. The only other long-term feeding studies conducted on sucralose were conducted by the manufacturer and did not find a problem. According to CSPI, the new study is more powerful than the industry-funded studies, which tested fewer animals, started exposing the animals beginning at adolescence as opposed to in utero, and ended earlier in the animals’ lives.